This article is about the youngest son of George V. For other uses, see Prince John. 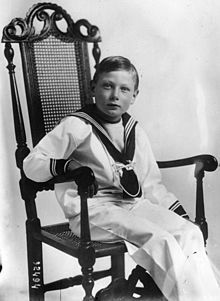 Prince John of the United Kingdom (John Charles Francis; 12 July 1905 – 18 January 1919) was the fifth son and youngest of the six children born to King George V and his wife, Queen Mary. At the time of John's birth, his father was the Prince of Wales and heir apparent to the reigning monarch of the United Kingdom, King Edward VII. In 1910, George succeeded to the throne upon Edward's death and John became fifth in the line of succession to the British throne. In 1909, John was discovered to have epilepsy. As his condition deteriorated, he was sent to live at Sandringham House and was kept away from the public eye. There, he was cared for by his governess, "Lala" Bill, and befriended local children whom his mother had gathered to be his playmates. Prince John died at Sandringham in 1919, following a severe seizure, and was buried at nearby St Mary Magdalene Church. His illness was disclosed to the wider public only after his death. Prince John's alleged seclusion has subsequently been brought forward as evidence for the inhumanity of the royal family. 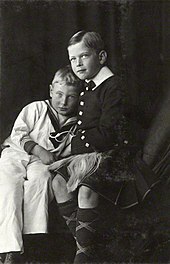 However, records show that the Prince was in some ways given favourable treatment by his parents, in comparison with his siblings, and contrary to the belief that he was hidden from the public from an early age, John for most of his life was a "fully-fledged member of the family", appearing frequently in public until after his eleventh birthday. His long acknowledged learning disability and a possible intellectual disability have both been linked to his severe epilepsy; recent speculation finds some behaviours consistent with autism. Prince John was born at York Cottage on the Sandringham Estate on 12 July 1905, at 3:05 a.m. 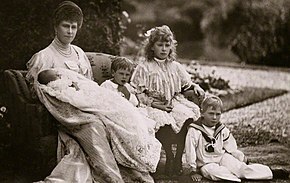 He was the youngest child and fifth son of George Frederick, Prince of Wales and Mary, Princess of Wales (née Mary of Teck). He was named John despite that name's unlucky associations for the royal family, but was informally known as "Johnnie". At the time of his birth, he was sixth in the line of succession to the throne, behind his father and four older brothers. As a grandchild of the reigning British monarch in the male line, and a son of the Prince of Wales, he was formally styled His Royal Highness Prince John of Wales from birth. Prince George holding Prince John. Photograph by James Lafayette, 1909. John was christened on 3 August in the Church of St Mary Magdalene at Sandringham, the Reverend Canon John Neale Dalton officiating. His godparents were King Carlos I of Portugal (his third cousin once removed, for whom the Prince of Wales stood proxy), the Duke of Sparta (his first cousin once removed), Prince Carl of Denmark (his uncle by marriage and first cousin once removed, for whom the Prince of Wales stood proxy), Prince John of Schleswig-Holstein-Sonderburg-Glücksburg (his great-great-uncle, for whom the Prince of Wales stood proxy), Alexander Duff, 1st Duke of Fife (his uncle by marriage, for whom the Prince of Wales stood proxy), the Duchess of Sparta (his first cousin once removed, for whom Princess Victoria of the United Kingdom stood proxy), and Princess Alexander of Teck (his first cousin once removed, for whom Princess Victoria stood proxy). Much of John's early life was spent at Sandringham with his siblings—​Prince Edward (known as David to the royal family), Prince Albert, Princess Mary, Prince Henry and Prince George—​under the care of their nanny Charlotte "Lala" Bill. Though a strict disciplinarian,[note 2] the Prince of Wales was nonetheless affectionate toward his children; the Princess of Wales was close to her children and encouraged them to confide in her. In 1909, John's great-aunt, the Dowager Empress of Russia wrote to her son, Emperor Nicholas II, that "George's children are very nice ... The little ones, George and Johnny are both charming and very amusing ..." Princess Alexander of Teck described John as "very quaint and one evening when Uncle George returned from stalking he bent over Aunt May and kissed her, and they heard Johnny soliloquize, 'She kissed Papa, ugly old man!'" George once said to U.S. President Theodore Roosevelt that "all [his] children [were] obedient, except John"—​apparently because John alone, among George's children, escaped punishment from their father. Though a "large and handsome" baby, by his fourth birthday John had become "winsome" and "painfully slow". That same year he suffered his first epileptic seizure and showed signs of a disability, probably autism. When his father succeeded as George V upon Edward VII's death in 1910, John was awarded the title "His Royal Highness The Prince John". 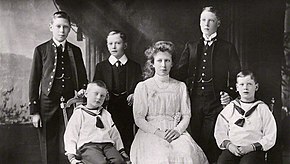 John did not attend his parents' coronation on 22 June 1911, as this was considered too risky for his health; nonetheless, cynics said that the family feared their reputation would be damaged by any incident involving him. Although John was deemed not "presentable to the outside world," George nonetheless showed an interest in him, offering him "kindness and affection". During his time at Sandringham, John exhibited some repetitive behaviours as well as regular misbehaviours and insubordination: "he simply didn't understand he needed to [behave]." Nonetheless there was hope his seizures might lessen with time. Contrary to the belief that he was hidden from the public from an early age, John for most of his life was a "fully-fledged member of the family", appearing frequently in public until after his eleventh birthday. In 1912 Prince George, who was nearest in age to John and his closest sibling, began St. Peter's Court Preparatory School at Broadstairs. The following summer, The Times reported that John would not attend Broadstairs the following term, and that George and Mary had not decided whether to send John to school at all. After the outbreak of World War I, John rarely saw his parents, who were often away on official duties, and his siblings, who were either at boarding school or in the military. John slowly disappeared from the public eye and no official portraits of him were commissioned after 1913. In spite of his physical and mental declines, John was not removed from the line of succession. In 1916, as his seizures became more frequent and severe, John was sent to live at Wood Farm, with Bill having charge of his care. Though John maintained an interest in the world around him and was capable of coherent thought and expression, with his lack of educational progress the last of his tutors was dismissed and his formal education ended. Physicians warned that he would likely not reach adulthood. At Wood Farm, John became "a satellite with his own little household on an outlying farm on the Sandringham estate ... Guests at Balmoral remember him during the Great War as tall and muscular, but always a distant figure glimpsed from afar in the woods, escorted by his own retainers." His grandmother Queen Alexandra maintained a garden at Sandringham House especially for him, and this became "one of the great pleasures of [John]'s life." After the summer of 1916, John was rarely seen outside the Sandringham Estate and passed solely into Bill's care. After Queen Alexandra wrote that "[John] is very proud of his house but is longing for a companion," Queen Mary broke from royal practice by having local children brought in to be playmates for John. One of these was Winifred Thomas, a young girl from Halifax who had been sent to live with her aunt and uncle (who had charge of the royal stables at Sandringham) in hopes her asthma would improve. John had known Winifred years earlier, prior to the outbreak of World War I. [note 3] Now they became close, taking nature walks together and working in Queen Alexandra's garden. Leslie Saward Heath (born 1914 in Wolferton Station House), whose Grandfather was Harry Leonard Saward RVM, the Royal Station Master at Wolferton from 1884 to 1924, also played with Prince John at the farmhouse. John also played with his elder siblings when they visited: once, when his two eldest brothers came to visit John, the Prince of Wales (formerly Prince Edward) "took him for a run in a kind of a push-cart, and they both disappeared from view." As John's seizures intensified (Bill later wrote) "we [dared] not let him be with his brothers and sister, because it upsets them so much, with the attacks getting so bad and coming so often." Biographer Denis Judd believes that "[John]'s seclusion and 'abnormality' must have been disturbing to his brothers and sister", as he had been "a friendly, outgoing little boy, much loved by his brothers and sister, a sort of mascot for the family". He spent Christmas Day 1918 with his family at Sandringham House but was driven back to Wood Farm at night. On 18 January 1919, after a severe seizure, John died in his sleep at Wood Farm at 5:30 p.m.
a great shock, tho' for the poor little boy's restless soul, death came as a great relief. [She] broke the news to George and [they] motored down to Wood Farm. Found poor Lala very resigned but heartbroken. Little Johnnie looked very peaceful lying there. for [John] it is a great relief, as his malady was becoming worse as he grew older, & he has thus been spared much suffering. I cannot say how grateful we feel to God for having taken him in such a peaceful way, he just slept quietly into his heavenly home, no pain no struggle, just peace for the poor little troubled spirit which had been a great anxiety to us for many years, ever since he was four years old. She went on to add that "the first break in the family circle is hard to bear, but people have been so kind & sympathetic & this has helped us much." George described his son's death simply as "the greatest mercy possible". On 20 January, the Daily Mirror said that "when the Prince passed away his face bore an angelic smile"; its report also made the first public mention of John's epilepsy. His funeral was the following day at St Mary Magdalene Church, John Neale Dalton officiating. Canon Dalton & Dr Brownhill [John's physician] conducted the service which was awfully sad and touching. Many of our own people and the villagers were present. We thanked all Johnnie's servants who have been so good and faithful to him. Though nominally private, the funeral was attended by Sandringham House staff; "every single person on the estate went and stood around the gates and his grave was absolutely covered in flowers." Prince John (right) and Prince George on a royal shopping trip. [he felt] like such a cold hearted and unsympathetic swine for writing all that [he] did ... No one can realize more than [she] how poor little Johnnie meant to [him] who hardly knew him ...I feel so much for you, darling Mama, who was his mother. In her final mention of John in her diary, Queen Mary wrote simply "miss the dear child very much indeed." She gave Winifred Thomas a number of John's books, which she had inscribed, "In memory of our dear little Prince." "Lala" Bill always kept a portrait of John above her mantelpiece, together with a letter from him which read "nanny, I love you." In recent years, Prince John's seclusion has been brought forward as evidence towards the "heartlessness" of the Windsor family, According to a 2008 Channel 4 documentary, much of the existing information about John is "based on hearsay and rumour, precisely because so few details of his life and his problems have ever been disclosed,"
adding that it was another twenty years before the idea that epileptics should not be locked away began to take hold. The royal family believed that these afflictions flowed through their blood, which was believed to be purer than the blood of a commoner, and, as such, wished to hide as much as possible in regard to John's illness. Others have suggested that John was sent to Wood Farm to give him the best environment possible under the "austere" conditions of World War I. Undoubtedly the royal family were "frightened and ashamed of John's illness", and his life is "usually portrayed either as tragedy or conspiracy". At the time that Edward VIII (formerly Prince Edward) abdicated, an attempt was made to discredit Prince Albert, who had succeeded as George VI, by suggesting that he was subject to falling fits, like his brother. In 1998, after the discovery of two volumes of family photographs, John was briefly brought to public attention. The Lost Prince, a biographical drama about John's life written and directed by Stephen Poliakoff, was released in 2003. In 2008, a documentary about John, titled Prince John: The Windsors' Tragic Secret, was released by Channel 4. John is also briefly mentioned in the 2010 film The King's Speech, which depicts Prince Albert and his struggle to overcome a childhood stammer. Lionel Logue, portrayed by Geoffrey Rush, asks the future George VI of the United Kingdom, played by Colin Firth, to describe his relationship with his youngest brother, called Johnny. George VI replies that Johnny was a "sweet boy", leading the audience to believe that they had a good relationship. ^ On 17 July 1917, due to a growing anti-German sentiment in the United Kingdom, George V changed the name of the royal house from the House of Saxe-Coburg and Gotha to the House of Windsor. Thus, as all of the members of the royal house received a surname, John's full name became John Charles Francis Windsor. ^ George once stated that "[his] father was frightened of his mother, [he] was frightened of [his] father, and [he was] damned well going to make sure that [his] children are frightened of [him] (Rees 2002, p. 256). ^ Among Winifred's memories of her time at Wood Farm, as recalled by her daughter, was a bicycle race between John and his cousin, Crown Prince Olav of Norway, who could not have been in England during World War I (Zeepvat 2003, p. 4). ^ Eilers 1987, p. 175. ^ a b c d e f g Reynolds 2004. ^ "No. 27816". The London Gazette. 13 July 1905. p. 4887. ^ "A Royal Christening". The Interior. Western Presbyterian Publishing Company. 36: 1133. 1905. OCLC 192107334. ^ Ziegler 1991, pp. 30–31. ^ Ziegler 1991, p. 79. ^ Athlone 1966, p. 78. ^ a b c d e f g h i j k l m n o Tizley 2008. ^ Poliakoff 2003, p. xivi. ^ Ziegler 1991, p. 47. ^ a b "Death of Youngest Son of King and Queen". Daily Mirror. 20 January 1919. p. 2. ^ Poliakoff 2003, p. lxiii. ^ As remembered by Winifred Thomas, quoted by her daughter in Tizley 2008. ^ a b Ziegler 1991, p. 70. ^ "Edward VIII letter describes 'great relief' over death of his brother, Prince John – Royal Central". royalcentral.co.uk. Retrieved 23 June 2018. Lichfield, John; Valley, Paul (11 February 1998). "Royal Albums: Revealed: the Lost Prince of the House of Windsor". The Independent. independent.co.uk. This page is based on the Wikipedia article Prince John of the United Kingdom; it is used under the Creative Commons Attribution-ShareAlike 3.0 Unported License (CC-BY-SA). You may redistribute it, verbatim or modified, providing that you comply with the terms of the CC-BY-SA.